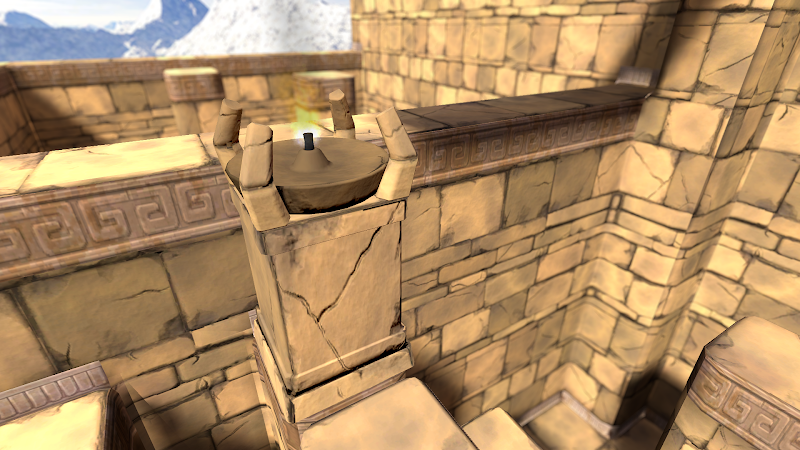 Eye of the Temple is a VR game that lets you explore a huge temple using your own feet. Keep your balance as you step from one enchanted moving stone to another, and dodge traps and solve puzzles with your torch and whip in hand. Eye of the Temple makes unique use of room-scale VR and delivers the experience of exploring a vast place. 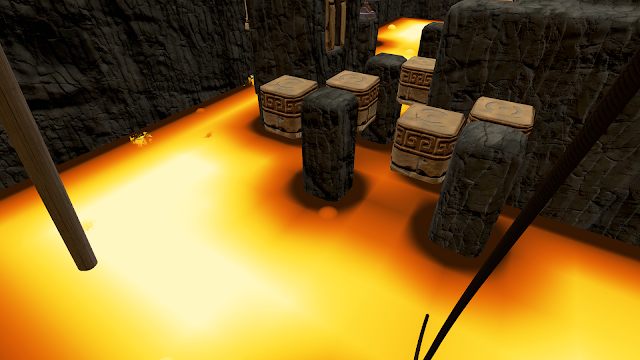 Lose yourself in the depths of the temple without teleportation, artificial locomotion, or other distractions taking you out of the immersion. Fire! 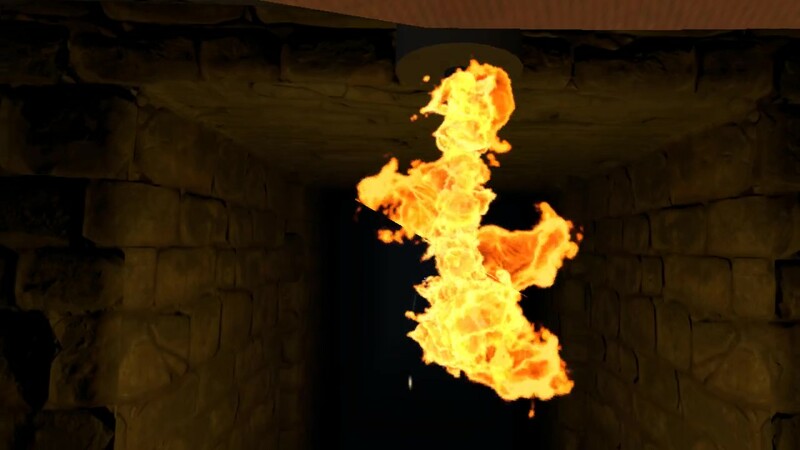 One challenge tunnel now has fire hazards. Blades! One challenge tunnel now has swinging blades. Speedrun mode! A more challenging way to play the game. More notes below. Hat! You're now wearing a hat. Hope you like hat. Experimental spectator camera. 3rd person view. More notes below. Field of view is now restricted when close to falling and when falling in order to further reduce risk of motion sickness. Placeholder ambient soundscape taken out of the game for now since it had confusing footstep sounds. For those of you who wanted more challenge in the game, there is a new speedrun mode. This mode times your play-through but also speeds up the platform movements as long as you can keep up. This mode is has a higher risk of being uncomfortable, causing motion sickness, and falling over, so engage on your own risk. Each time you take a perfectly timed step onto a new platform, the game will speed things up a little bit. When you die, the speed is reset, so it's recommended to keep to a speed you can handle in order to not lose momentum in your speedrun. You can avoid speeding thing further up by taking steps in a slightly slower way. I do not recommend this mode to people who haven't already played through the game at least once, so in the final game I'll probably only unlock the speedrun mode by completing the game. How to use: For now though, you start a speed run by first starting a new game, and then press Shift+R on the keyboard. 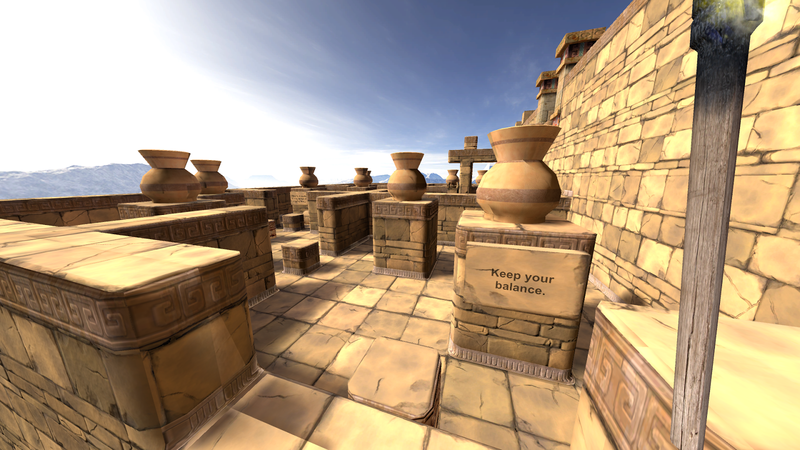 The gameplay in Eye of the Temple can be hard to get an impression of for others by looking out in first person. I've experimented with an alternative camera angle shown on the monitor that shows the action from 3rd person perspective. How to use: Activate/toggle 3rd person spectator camera by pressing X on the keyboard. This view requires extra resources from your computer, so if you get performance problems, turn it off. What do you think of 3rd person spectator camera? Is it something you might use for streaming, videos, or for people watching you play? It's still a bit buggy and has room for improvement, but I'm curious what you think of the overall idea. 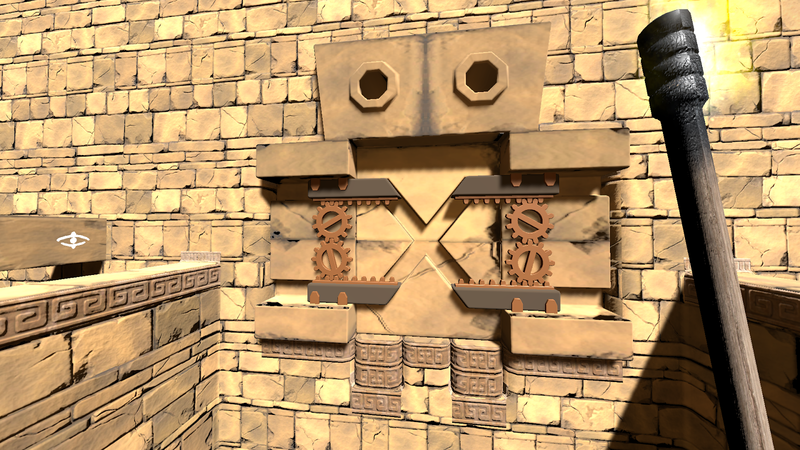 Here's the latest updates on the development of my Vive VR game Eye of the Temple. For the past month I've been mainly working on improving the whip I prototyped last year. It can now be used to grab levers at a distance, and then you can yank the whip backwards to activate the lever. There's still some way to go, especially with getting the audio cues right. The physics will never be quite like a real whip, but making it satisfying to use is the top priority. 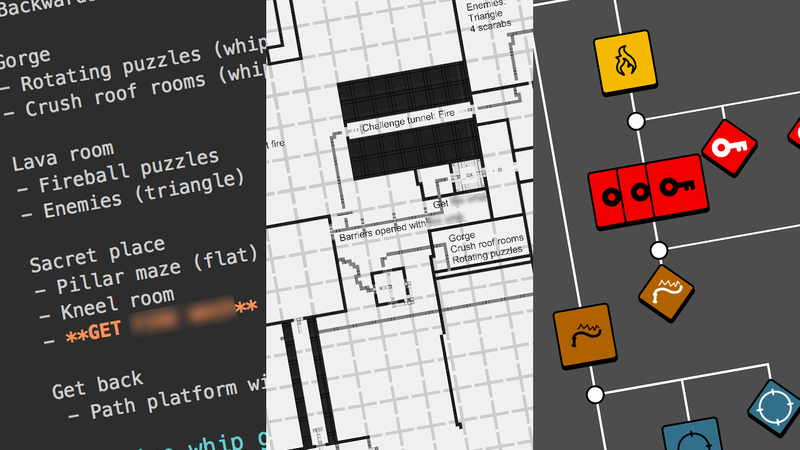 Apart from this I've been looking into designing more puzzles for the game. I'm no expert puzzle designer, but bit by bit I come up with some that I think work well. The latest involve tall rotating towers, activated by levers (no whip use necessary for this one) where you need to step around on and in them at two different levels. 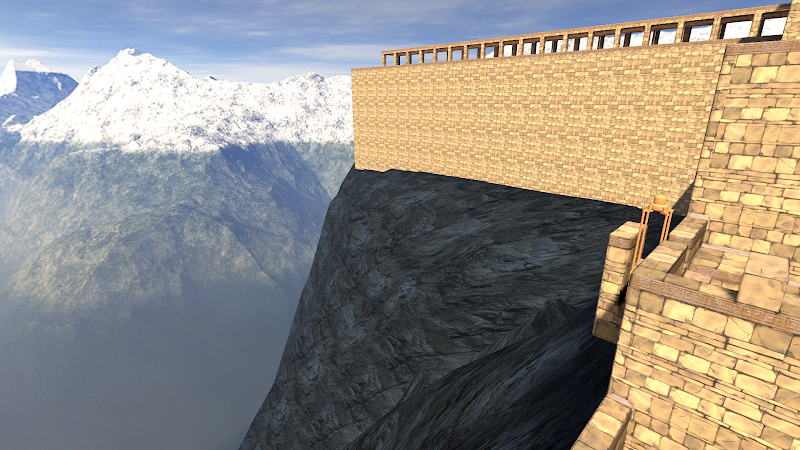 This also marks my increased effort in making better use of verticality in the level design. 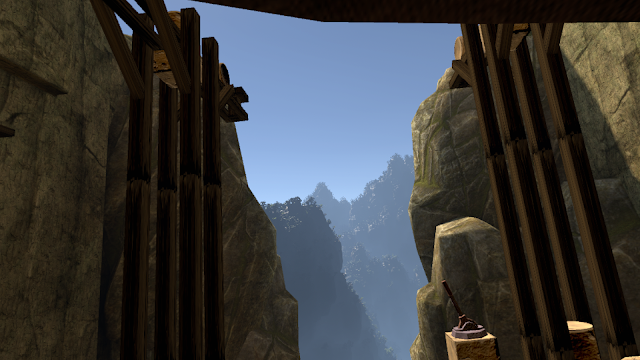 Experiencing the great heights is a draw of the game, and I'm figuring out how to use that optimally. I don't have a new build with these new things yet. 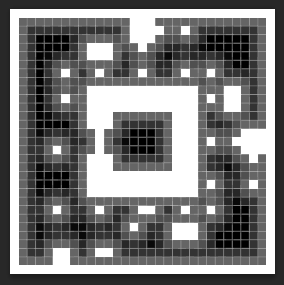 The work right now is on smaller isolated pieces and puzzles, and once I have a set of those that fit nicely together, I'll begin integrating it all back into the overall world design. 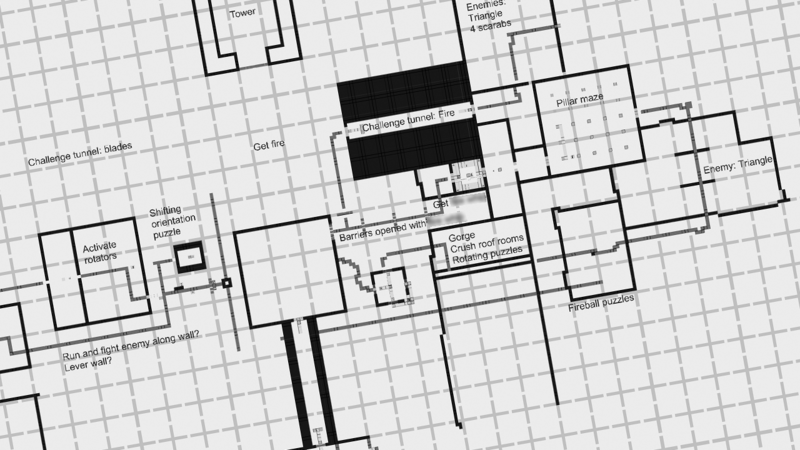 It's time for a new update on the development of Eye of the Temple. GDC in March is well behind us and I had a great time there. Among other things, I got to show off Eye of the Temple at the European Game Showcase (and saw a lot of other cool games too). This was a private event for specially invited people from the network of the organizers. 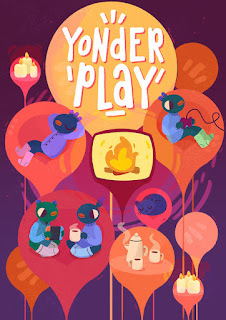 Now, Eye of the Temple has been selected for Yonderplay, an event that's part of the Nordic Game Conference in Malm� in Sweden and open to everyone at the conference. This will go down on May 25, the last day of the conference. This is the most public showing of the game yet, and I'm very excited about it! 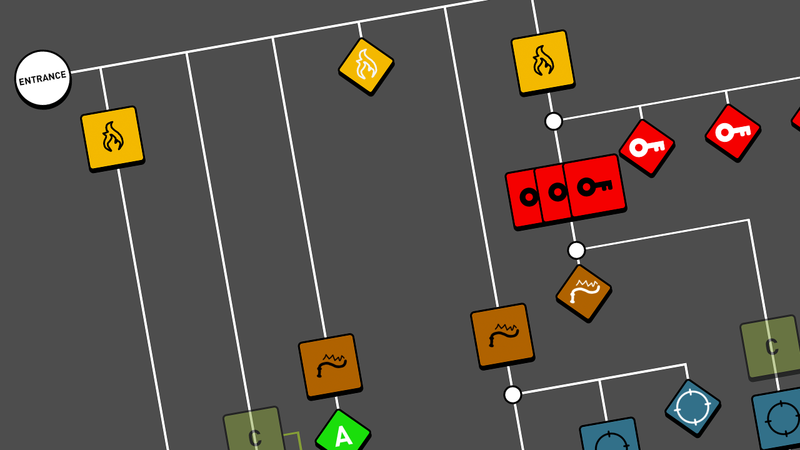 If you'll be at Nordic Game Conference yourself, come by and say hi and give the game a try. At GDC I also met some of the fine people from LIV, a platform for mixed reality recording (and more) for VR content. I've been integrating support for LIV in Eye of the Temple (it's very easy) and a handful of people from their community has been helping me test the game both with focus on mixed reality and in general. Apart from testing and feedback, I've also been allowed to create and use some gifs from their recordings. Being able to show Eye of the Temple in mixed reality is very exciting to me, since it shows the physical nature of stepping around in the game in a way that's been impossible with regular purely virtual footage. Here's a few examples: These gifs are featuring ThreeDee from ComedyPipe. I tweeted them here and here. I would love to have mixed reality gifs with others playing the game as well. If you have Vive or Oculus Rift with a mixed reality setup and is up for it, please get in touch! 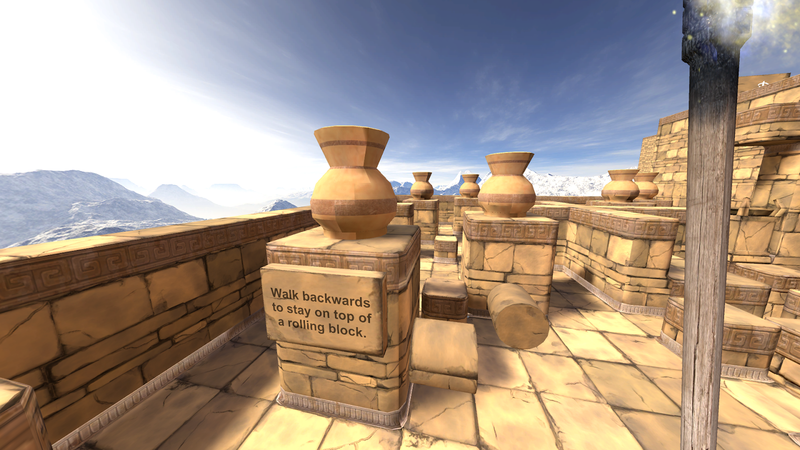 Last but not least, I just implemented a new feature in the game: Pots! Pots contain gems. You can tap the pots gently to get the gems out a few at a time or just smash the pots with your whip or torch to get all the gems all at once. But that would be a shame for such antique and rare pottery, now wouldn't it? The pots give players more opportunities to use the whip, which I think was much needed. They also add more physicality to the game, since the pots (and the shards if they're smashed) are physics-driven objects. Hopefully it also adds just a bit of player expressiveness potential and unpredictability to the game. A player can intentionally smash a pot, or intend to just brush it softly with the whip to tease out gems in a non-destructive way. This can however still accidentally make it topple over and fall down and get smashed way below. Players could set goals for themselves to smash all pots or avoid smashing any. Whether this will happen in practice is yet to be seen but it at least feels nice to me to allow for different approaches like this. I made this silly and crudely acted video showcasing the new pots. Do you enjoy pottery too? Let me know in the comments! This feels really good to use now. It didn't get to this point without a lot of issues on the way though. 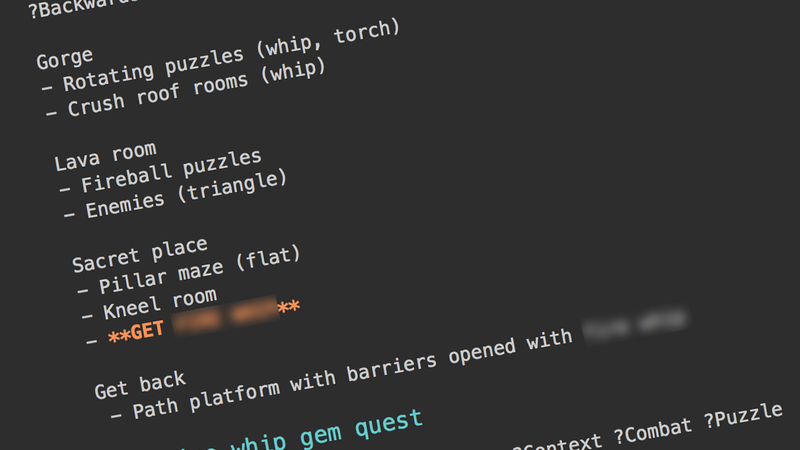 A bit of background on how the whip is implemented in broad strokes. 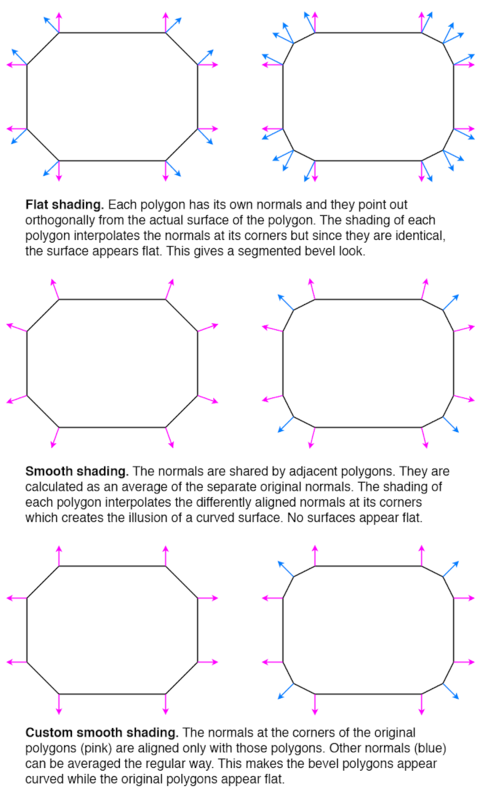 Using physics joints etc. quickly turned out infeasible when I did the prototype last fall. 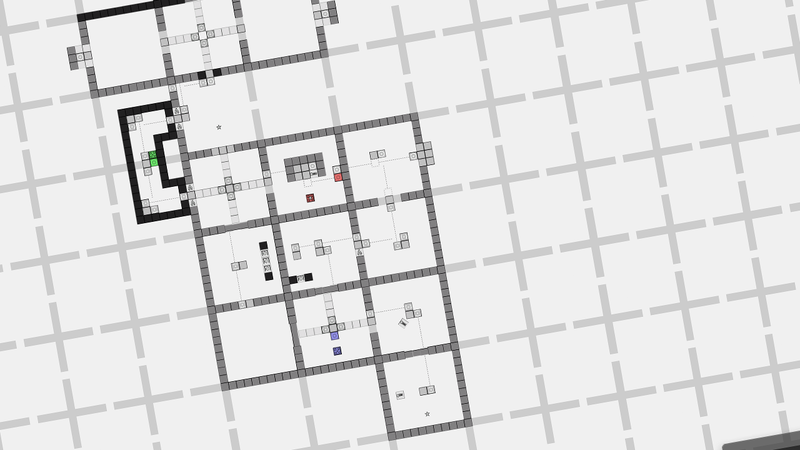 Instead, I�m keeping track of positions and velocities of �links� in arrays in my own scripts and doing very custom simulation with lots of tweaks and workarounds. One of the needed things to make it behave whip-like is that in the spring code that maintains distance between adjacent links, one link should affect the other slightly more than the other affects the first. 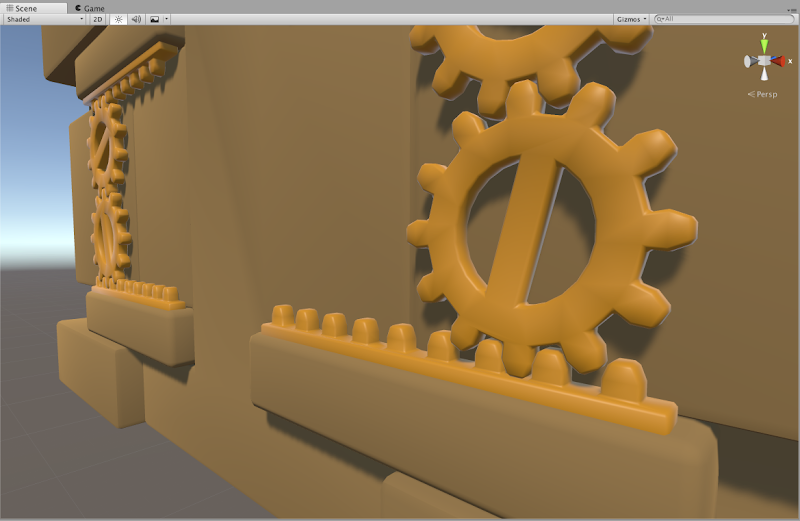 This is to simulate the fact that the whip gets thinner towards the end, which is critical for whip-like behavior. 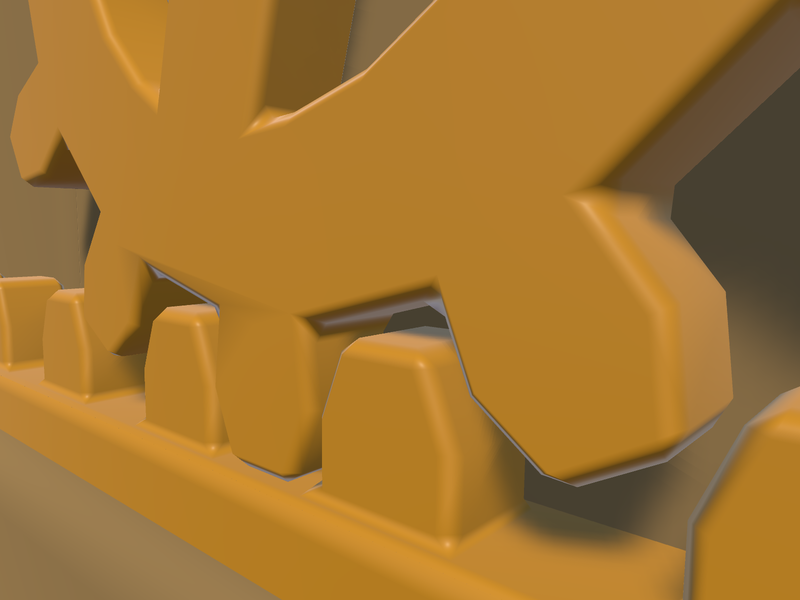 Collisions with level geometry works by doing sphere-casts, one per whip link per frame, which is around 30. 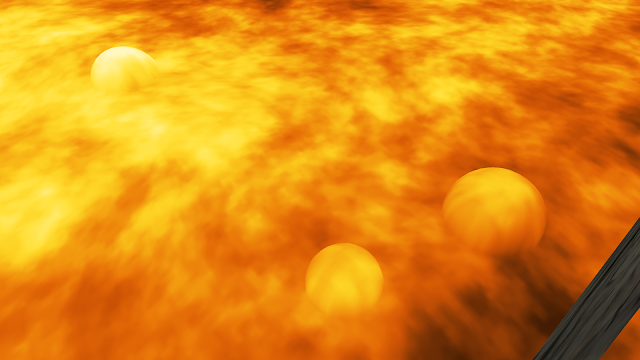 The spherecasts are from the previous position of a segment to its new position, and if anything was hit, I move the new position to the intersection point, which should be in between the old and the original new position. That's the basics. First, the collider of the lever handle must not overlap with any other colliders in the world. The tricky thing here is that it's not easy to see that overlapping colliders might affect the handle, since the handle is firmly locked in place. But they do affect it in very non-obvious ways. 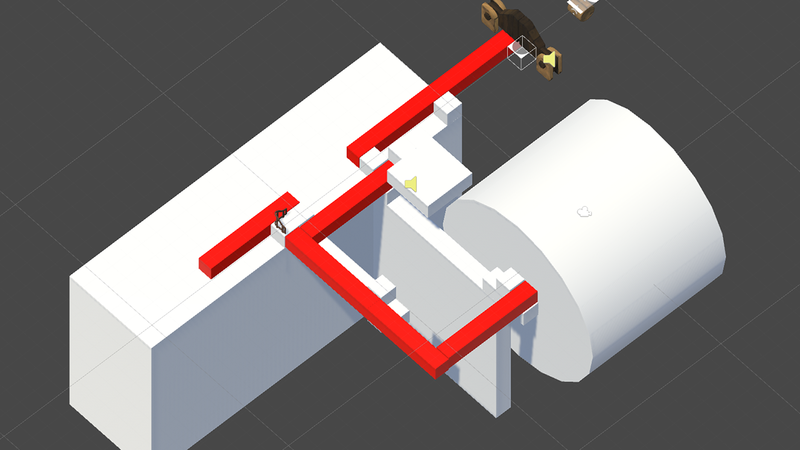 So I ensured the handle collider doesn't overlap with any other colliders. Thirdly, the center of mass of the rigidbody must be overwritten in script to be set to the pivot that the handle should rotate around. Unfortunately, this leads to another problem. Sometimes the lever handle would get completely stuck, in which case no amount of forces would make it move one bit. After some experimentation, this seemed to happen if the handle is exerted to forces while the connected rigidbody (which is kinematic) simultaneously move. 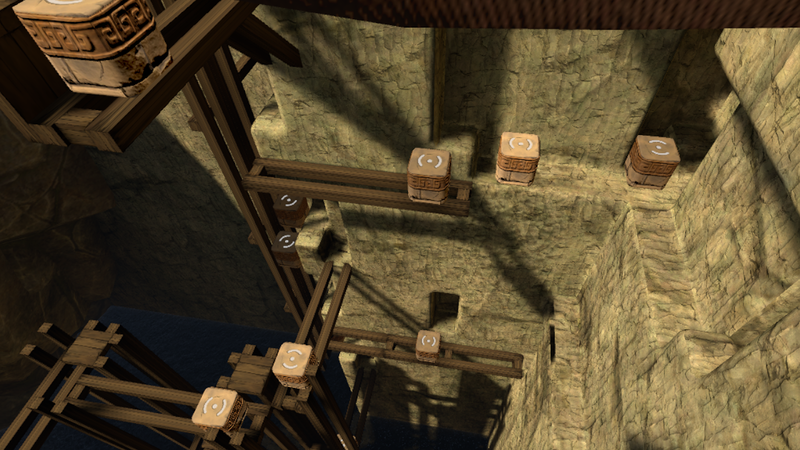 (Some levers in my game sometimes get moved around.) 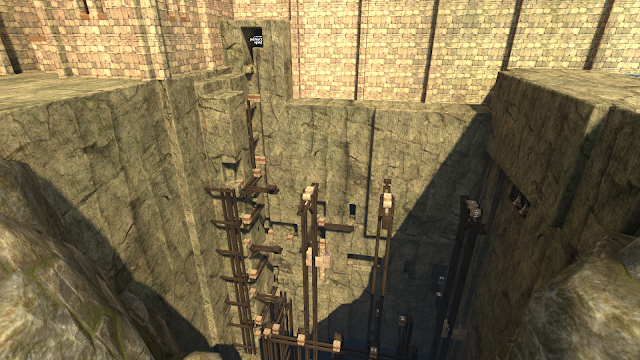 I worked around this by disabling the rigidbody position locking at strategic times and then reenabling it again. This seemed to fix the issue. 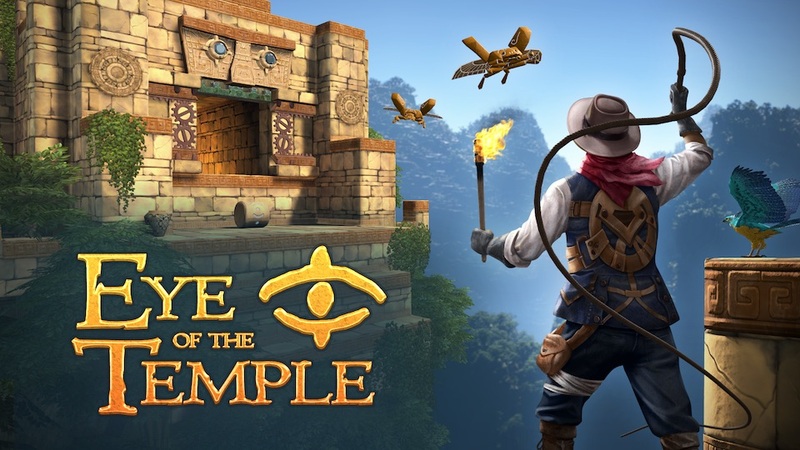 If you've been following the development of Eye of the Temple, does the whip related gameplay change how you view the game? What do you think it adds to it?